GL Where are we now? 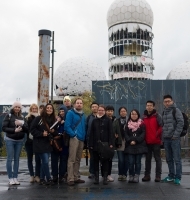 In October 2013, the IMD visited the site of the former field station on the Teufelsberg in Berlin. 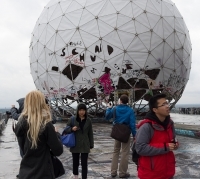 In order to convey the multi-tiered history of the place, a corresponding local approach of the grounds has been planned: View of the ensemble from the observation deck of the bell tower at the Olympic Stadium - walking approach and ascent from the Berlin-Grunewald S-Bahn station - inspection of the grounds and the buildings (Tour by Katharina Beckmann, co-author of the book "Field Station Berlin") - Retrospect of the Teufelsberg from the observation deck from the Grunewald Tower.